The main features of the arts of Kerala are the spectacular visual effects and mind blowing music. The various art forms of Kerala can bring a pride to our state. There is no other state in India which can boast of about such magnificent and creative art forms. All the art forms of Kerala are encouraged and accepted by the Kings of older times as well as the government of today. Kerala has got a rich culture rich with a great heritage. The arts have kept alive the cultural and heritage of Kerala. The arts that are performed by various artists are a treat to the eye but for the natives as well as for the tourists. There are a large variety of art forms and the stunning performances by the artists make it worth watching. The characters enacted by these artists are usually legendary characters from the history and their performance make the audience have a feeling that they have returned back to life. In the olden times, the rulers and kings appreciated these art forms and enjoyed them. The feudal system of today has also helped in contributing to these art forms. The northern Kerala is a stock of various types of art and culture. The main interests of the people from upper caste are the art forms like Kathakali and Bharathanatyam. And the lower caste people are famous for their dance forms like theyyam and padayani. The upper caste gets the opportunity to perform from large stage or in temple compounds whereas the lower caste people have to perform from streets. The famous performing art forms of Kerala include Kalaripayattu, Mohiniyattom, Chakyar Koothu, Theyyam, Ottam Thullal, Bharathanatyam, Chavittunadakam, Poorakkali etc. The earliest population of the state has got their own art forms. A harvest dance called as the Cherumarkali is one such dance form. The dancers which include both men and women dance in rhythm to the drumbeats. This dance gives the audience an enjoyable moment. Very colorful and dashing cultural procession is a part of almost all the festivals. During temple festivals, the idols of Gods are decorated with glittering gold, ornaments and beautiful flowers and are taken for procession. It is also accompanied by large crown singing hymns and playing drums and nadaswarams. The greatest cultural temple festival of Kerala is the Thrissur Pooram which is celebrated in the month of May. There are many religions in Kerala. In the early times, the religious practice of the people was based on their Dravidian way of living. As a result of this, the people followed many old rites and cultures. The people believed and worshipped local deities and they also worshipped trees and their ancestors. It was after this that the new communities belonging to Jainism, Buddhism and the Aryans came to this place. Theyyam which is also called as Kaliyattam is a popular art form of northern Kerala. Theyyam includes dance, music and mime. Patayani is another art form which is conducted in Kaali temples. It is held near the Pamba River in the month Meenam and Medam. This art form lasts for around a week. Poothanumthirayum is another ritual which is performed for Goddess Kaali and is famous in South Kerala. The dancers include those dressed up as Kaali and some others who are dressed as Poothams. Pallippaana is a ritual art as an offering to goddess Bhadrakaali. This is famous in the Thrissur, Palakkad and Malappuram districts. Mudiyettu is another ritual art performed from Kali temples of Ernakulam and Kottayam. This dance is performed to celebrate the victory of Goddess against Daarikan. Koothu is an art conducted from Koothambalam as a part of Kootiyattam or as an individual performance. Kannyarkali which is also called as Desathukali is performed by the Nair caste of the Palakkad district. Arjuna nritham is an art that are performed by the men from the Bhagavathy temple. 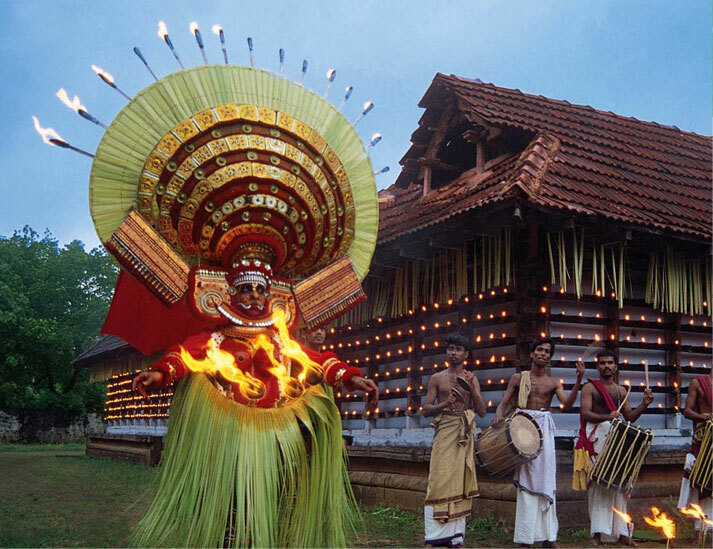 Tholppavakkoothu is performed in the Kaali temples of Palakkad district. Velakali is a martial arts performed by the men in temples. The performers wear costumes of the medieval Nair soldiers. Kalamezhuthu is an art of drawing on the floors using various colored powders. Margomkali is a dance form performed by the Syrian Christians. The dancers wear traditional dresses and around 10-12 dancers perform around a lighted lamp. Kavadiyattom is ritual performed as an offering to Lord Subramanya. It is seen mainly in Subramanya temples.